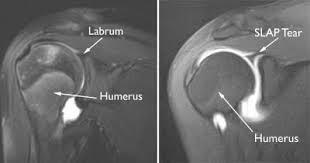 A SLAP tear or SLAP lesion is an injury to the glenoid labrum (fibrocartilaginous rim attached around the margin of the glenoid cavity). Tears of the superior labrum near to the origin of the long head of biceps were first described among throwing athletes by Andrews in 1985.The label of ‘SLAP’, an abbreviation for superior labrum anterior and posterior, was coined by Snyder et al, who went on to create a classification system for these lesions. A total of four types of superior labral lesions involving the biceps anchor have been identified. Type I concerns degenerative fraying with no detachment of the biceps insertion. Type II is the most common type and represents a detachment of the superior labrum and biceps from the glenoid rim. Type III represents a bucket-handle tear of the labrum with an intact biceps tendon insertion to the bone. Finally, type IV lesions, the least common type represents an intra-substance tear of the biceps tendon with a bucket-handle tear of the superior aspect of the labrum. Type V: a Bankart lesion that extends superiorly to include a Type II SLAP lesion. 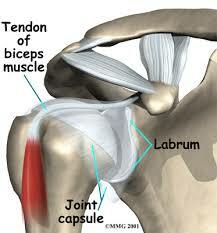 Type VI: an unstable flap tear of the labrum in conjunction with a biceps tendon separation. Type VII: a superior labrum and biceps tendon separation that extends anteriorly, inferior to the middle glenohumeral ligament. Recently Nord and Ryu have added several previously unclassified lesions to the classification scheme. A Type VIII SLAP lesion is a SLAP extension along the posterior glenoid labrum as far as 6 o’clock. A Type IX lesion is a pan-labral SLAP injury extending the entire circumference of the glenoid. A Type X lesion is a superior labral tear associated with posterior-inferior labral tear (reverse bankart lesion ). The shoulder complex is one of the most sophisticated areas of the body. The shoulder is made up of five joints; the Acromioclavicular Joint, the Sternoclavicular Joint, the Glenohumeral Joint, Scapulothoracic Joint and Suprahumeral Joint and four linked bone groups; the clavicula, sternum, Scapula and the humerus which are related and work together. The major joint is the Glenohumeral Joint, which is also called the ‘ball in a socket’ joint because of the humeral head (ball) that articulates with the glenoid cavity (glenoid fossa of scapula or socket).But the humeral head is larger than the fossa and so the socket covers only a quarter of the humeral head. A circumflexial rim of fibrocartilaginous tissue called labrum glenoidalis firmly attaches to the glenoid fossa thereby increasing the articular surface area and the stabilisation of the glenohumeral joint. The long arm of the biceps inserts directly into the superior labrum, which also provides stabilisation to the superior part of the joint.In addition, the rotator_Cuff muscles are essential to ensure dynamic shoulder stability as they prevent excessive translations of the humeral head at the level of the glenoid fossa. A cordlike middle glenohumeral ligament without tissue at the anterosuperior labrum. The identification of these normal variants can help to prevent the misdiagnosis of labral lesions. The age of the patient has an impact on the superior labrum. From the average age of 35, the superior labrum is less firmly attached to the glenoid than in people under the age of 30. In the age category 30 to 50, there are more chances of tears/defects in the superior and anterior-superior regions of the labrum (noted in cadavers). In the age category 60 years or older, circumferential lesions have been identified. Thus, we can conclude that there is an age-related effect in which the older the patient is, the more likely he will incur a SLAP lesion, due to age-related changes. In one study, half of the cases that had a SLAP lesion were 40 years old patients who showed signs and symptoms of instability after a history of acute trauma, repetitive injury, fall on an outstretched arm, or an injury from heavy lifting. Most of them had a type II SLAP lesion. They also noticed that the type II SLAP lesions in patients under 40 were associated with a bankart_lesion , other than a type II SLAP lesion in patients under 40 years old, whose SLAP lesion were associated with a tear of the supraspinatus tendon and osteoarthritis of the humeral head. The two most common mechanisms are falling on an outstretched arm in which there is a superior compression, and a traction injury in the inferior direction. Falling on an outstretched arm is an acute traumatic superior compression force to the shoulder. In this situation the shoulder is abducted and slightly forward-flexed at the time of the impact. A subsequent study found that the most common mechanism of injury was a fall or direct blow to the shoulder, occurring in 31% of patients. A significant number of patients with superior glenoid lesions and concomitant impingement or rotator cuff disease in the absence of trauma has also been identified. Indeed, Snyder et al found partial-thickness or full-thickness rotator cuff disease in 55 (40%) of 140 patients with SLAP lesions. Superior migration of the humeral head can result from a rotator cuff that is not effectively performing its role as a humeral head depressor. The superior labrum and biceps anchor could theoretically be gradually lifted off the glenoid as a result of chronic repetitive superior translation of the humeral head on the glenoid rim. Other authors supported the theory of an inferior traction mechanism on the basis of a sudden, traumatic, inferior pull on the arm or repetitive microtrauma from overhead sports activity with associated instability. Throwers can have repetitive microtraumata. At the moment of the impact the glenohumeral contact point is shifted posterosuperiorly and increased shear forces are placed on the posterior-superior labrum, which results in a peel-back effect and eventually in a SLAP lesion. Athletes performing overhead movements, especially pitchers, may develop “dead arm” syndrome in which they have a painful shoulder with throwing and can no longer throw with pre-injury velocity.They may also report a loss of velocity and accuracy along with discomfort in the shoulder. It is important to keep in mind that the scapula is an important factor during shoulder movements. When the scapula does not perform its action properly there is a scapular malposition. This decreases the normal shoulder function.It changes the activation of the scapular stabilising muscles. , which are the serratus anterior, rhomboid major and minor, levator scapulae and trapezius. The rotator-cuff muscles are important as well to anchor the scapula and guide the movement. The glenoid labrum is often involved in shoulder pathology. Sometimes morphological varieties can be confused with pathological aspects and therefore diagnosis should be established following careful analysis of the case history and a physical examination.There are two regions where anatomic variants can appear: the superior region, where it’s mostly related to age, and the anterosuperior region, where sometimes there is no labrum (12%) or a cord like ligament that is in continuity with the biceps footplate (13,5%). SLAP tear itself accounts for 80–90% of labral pathology in stable shoulder but it’s only found in 6% on arthroscopy. SLAP lesions are often seen in combination with other shoulder problems and this makes it difficult to diagnose.SLAP lesion is mostly combined with a lesion of the proximal head of the biceps because it attaches on the superior part of the labrum glenoidalis. It is associated with pain and instability and an inability of the patient to perform overhead movements. According to William F.B., SLAP lesions had an association of 43% with the medial sheath lesion. the author postulates that forces that affect the biceps anchor may also damage the pulley system of the bicipital sheath and, as such, this anatomic structure should be evaluated, especially when SLAP lesions are present. According to Morgan CD et al., Rotator cuff tears were present in 31% of patients whit SLAP lesion and were found to be lesion-location specific. Also suprascapular neuropathy secondary to cyst compression in the spinoglenoid notch may occur in association with SLAP tears. SLAP lesions are difficult to diagnose as they are very similar to those of instability and rotator cuff disorders. At first the clinician can test the tenderness to palpation at the rotator interval which can be helpful in the diagnostic procedure. The rotator interval is an anatomic space between the Supraspinatus tendon, the Subscapularis tendon and the processus coracoideus. This rotator interval has a triangular shape in which the supraspinatus is superiorly located, the subscapularis inferiorly and the processus coracoideus medially. It contains the coracohumeral and the superior glenohumeral ligament, the biceps tendon and the anterior joint capsule. If you know where these structures are situated, you can try to palpate the rotator interval. This can be followed by these tests that are positive when there is a presence of a SLAP lesion: positive anterior drawer (53%), positive apprehension at 90° of abduction and maximal external rotation (86%), and positive relocation test (86%). In addition, several special tests can be used to help identify the presence of a SLAP lesion including the Clunk test, the crank test, O’ Briens, Anterior Slide test, Biceps Load I and II test, and the Active Compression test. Another very important diagnostic element is the use of clear radiological and arthroscopic images of the labrum, which can help clinicians to distinguish the pathology from normal variation and make the correct diagnosis. MRI is the most common imaging tool used to diagnose labral lesions, although it may not show a SLAP lesion. Therefore an MR arthrogram, where a contrast material gets injected into the shoulder, is also used. This is able to detect a SLAP tear better than a normal MRI scan. Thus, MRA is more useful than conventional MRI and CT arthrography, and is a helpful technique in the diagnosis of SLAP tears. However, there is a great chance of false positive results due to a superior labral recess or sulcus, which is a normal variant, but can make the diagnosis more difficult. The total score ranges from 12 to 60 (12 indicates the best possible function). A link to the questionnaire is added to the resources list below. The responses for each question are given on a scale from 0 to 100 (0 equals the best possible score and 100 equals the worst). EQ-VAS is a Visual Analogue Scale to measure the current health state, ranging from 0 (worst health state) to 100 (best health state). According to Skare et al (2014) the OISS, WOSI and the Rowe score are responsive in the evaluation of patients with SLAP lesions. They also documented that the OISS and Rowe score appear to be the most sensitive measures. Clinical examination to detect SLAP lesions is an extremely challenging procedure because the condition is frequently associated with other shoulder pathologies in patients presenting this type of condition. As with most shoulder conditions, the history including the exact mechanism of injury should be documented. It is important to keep in mind that while labral pathologies are frequently caused by overuse, the patient may also describe a single traumatic event. The physical examination is also very important in determining the correct diagnosis, however physical examination should not be used in isolation because the literature does not confirm that special tests can accurately identify SLAP lesions. A combination of 2 sensitive tests and 1 specific test is more efficient to diagnose a SLAP lesion [reference needed]. If one of the three tests is positive, this will result in a sensitivity of about 75%. But if all three tests are positive this will result in a specificity of about 90%. When we consider some tests individually, one can consider the Speed’s test and O’Brien’s test helpful in the diagnosis of anterior lesions and the Jobes Relocation Test is often positive in a posterior lesion According to Meserve et al, the O’Brien test is the most sensitive test (47%-78%) and the Speed’s test the most specific (67%-99%). There are studies who combined few of the tests but the data differ too much therefore it’s difficult to make a general conclusion. There is a lot of discussion about which test is most accurate, but most experts consider that arthroscopy is the best way to diagnose SLAP lesion. The surgical intervention depends on the type of labral lesion, but an advanced arthroscopic technique is most commonly used. Studies of surgical labral repairs show that they are generally good to excellent to allow the patient to return to a pre-injury level of function. Knowing the type of SLAP lesion is important for post-operative rehabilitation. Type I: are treated with debridement. Straightforward arthroscopic shaving, without damaging the biceps anchor, is enough for the surgical treatment of this type of lesion. Type II: can be treated with arthroscopic fixation of the superior labrum to establish biceps anchor stability. The major studies suggested an extremely high level of success in arthroscopic repairs. According to Morgan et al, 97% of patients who underwent arthroscopic repair of type II SLAP had good, and even excellent results. But clinical results of elite throwing athletes has shown that this is in fact not always the case.Detachment of the superior labrum from the glenoid is recognised as a problematic injury in throwing athletes and others who engage in repetitive overhead activities. Luckily for these athletes, Samani JE et al., concluded that using an absorbable tack to repair type II SLAP lesions is an effective treatment, even in athletes with high demands and expectations for shoulder function. For patients older than 36 years there is a higher chance of failure.Because of unsatisfactory results in older patients, Boileau et al., suggested arthroscopic biceps tenodesis in these patients. They found that tenodesis is superior to the repair of type II SLAP tears in older population. Arthroscopic biceps tenodesis can be considered as an effective alternative to the repair of a type II SLAP lesion, allowing patients to return to a pre-surgical level of activity and sports participation. The results of biceps reinsertion are disappointing compared with biceps tenodesis. Furthermore, biceps tenodesis may provide a viable alternative for the salvage of a failed SLAP repair. However in another study by Alpert et al., it is shown that type II SLAP repairs using suture anchors can yield good to excellent results in patients older and younger than age 40. Their findings show no difference between the two age groups. So there are conflicting views in the literature about the repairs in the older patients. Type III: can easily be debrided by an arthroscopic shaver. There is no need to repair this type of injury. After the resection of the free fragment, a pain free shoulder can be established. Type IV: can be repaired with multiple sutures. Field and Savoie reported 100% good results at an average follow-up of 21 months. Also Pagnani et al., reported that superior glenoid lesions with unstable biceps anchors (type IV lesions), which were stabilised with absorbable tacks obtained good results. At their 2-year follow-up, 86% of the patients had satisfactory results, and no complications were related to use of the tack. Stetson et al., presented the long-term results of 140 SLAP lesions with follow-up available on 130 patients at an average of 3.2 years. Type IV lesions in 17 patients (13%) were debrided. SLAP lesions are repaired by the use of portals. There are different portals: a posterior portal, a anteroinferior portal and a mid-glenoid portal. Similarly, O'Brien described the creation of a trans-rotator cuff portal for repair when the lesion is posterior to the biceps tendon, and Burkhart has advocated the use of a posterolateral portal (Port of Wilmington) as part of a SLAP repair. More recently, Nord et al. described the use of the Neviaser portal, a superior medial portal, as the working portal in SLAP repairs. There is no specific portal used for each type a SLAP lesion. The use of a certain portal is determined by a combination of location and the surgeon’s preference. Until now only one study looked at results from physical management on SLAP lesion. The study was a one year follow- up study of with 19 patients. It compared good shoulder function with the shoulder function of patient that followed successful conservative management in the form of scapular stabilization exercises and posterior capsular stretching. However the study acknowledges that more than half of the treatment of patients who were initially prescribed non operative management failed and these patients went on to undergo arthroscopic surgery. It is generally recognized that the majority of patients with symptomatic SLAP lesions will fail conservative management, particularly throwers.Given that conservative management only seems to be successful in a few patients, mainly in type I SLAP lesions, it is only implemented in patients with this type of lesion or patients who do not wish to undergo surgery. In the first step of conservative management, patients should abstain from aggravating activities in order to provide relief to the pain and inflammation. If necessary, NSAID’s and intra-articular corticosteroid injections can be applied to help diminish complaints.This way, physical treatment can be started sooner. Strength, stability and motion are the components of shoulder function that should be focused on during rehabilitation.This course of treatment should focus on restoring strength of the rotator cuff, shoulder girdle, trunk, core and scapular musculature, restoring normal shoulder motion, and training to improve dynamic joint stability. Regaining GIRD is a crucial aspect in the rehabilitation of SLAP lesions.By the use of posterior capsule stretching exercises, such as sleeper stretch and cross body adduction stretches, and exercises for scapula stabilisation, redevelopment of the internal rotation can be accomplished. By stretching the posterior capsule and restoring internal rotation, through posterior capsule stretching exercises, such as sleeper stretch and cross body adduction stretches, and exercises for scapula stabilisation , pathologic contact between the supraspinatus tendon and the posterosuperior labrum.can be prevented. The patient is eventually advanced to a strengthening phase, which includes trunk, core, rotator cuff, and scapular musculature. In throwing athletes, a progressive throwing program that is directed toward the patients' specific sport and position can be initiated after 3 months. Sixteen commonly used shoulder rehabilitation exercises can be chosen on the basis of several EMG studies and clinical recommendations regarding the rehabilitation of patients with SLAP lesions. These exercises, with increasing low to moderate activity, can be applied in the early and intermediate phases of nonoperative and postoperative treatment for patients with proximal biceps tendon disorders and SLAP lesions. When conservative treatment fails, a surgical approach is in order. After surgery, for 3 to 4 weeks, the shoulder of the patient is placed in a sling, which immobilises the shoulder in internal rotation and leads to general loss of motion and stiffness.Postoperative rehabilitation is determined by the type of SLAP lesion, the chosen surgical procedure and other concomitant pathologies and procedures performed. Generally pendulum and elbow range-of-motion exercises are allowed during the period of immobilization. External rotation must absolutely be avoided and abduction limited to 60°. Assisted and passive techniques are used at 4 weeks post-operative to increase shoulder mobility. Between week 4 and 8, internal and external rotation ROM are progressively increased to 90° of shoulder abduction. Resistance exercises can be initiated at approximately 8 weeks post-operative, in which scapular strengthening should be emphasized. Since the metabolism of cartilage depends partly on its mechanical environment, resistance training can contribute to gaining mobility. However, the achievement of adequate shoulder mobility is an important condition to begin resistance training. At month 4 to 6, dependent on the type of sport practiced, patients should be able to start sport-specific training and gradually return to their former level of activity. If a biceps tenodesis is performed a minimum of 10 weeks is recommended without biceps activity to allow the repaired soft tissue to fully incorporate into the bone tunnels. SLAP lesions are lesions of the superior labrum in which there are several types described. A SLAP lesion is mainly caused by a fall on an outstretched arm where there is an important superior compression on the labrum which causes a tear of the labrum. A typical symptom is intermittent pain that also occurs in overhead movements. To diagnose this condition it is important to use several different tests and not only one. Physical examination is not easy because of the fact that SLAP lesions are often associated with other shoulder pathologies. For the physical examination the therapist uses the tests described in ‘Diagnostic Procedures’, but apart from that he can also test the glenohumeral and scapulothracic range of motion because there could occur a dyskinesis caused by the SLAP lesion. For the treatment of SLAP lesion one uses often a medical treatment where the surgeon uses advanced arthroscopic techniques. But a physical treatment is also possible. This includes stretching, strengthening, and stabilisation exercises. It is important to note that every treatment depends on the type of the SLAP lesion and that conservative treatment may fail and is not suited to every patient.